If this card has a “Photon” card as material, it cannot be destroyed by card effects. You can only use each of the following effects of “Number 90: Galaxy-Eyes Photon Lord” once per turn. ● When an opponent’s monster activates its effect (Quick Effect): You can detach 1 material from this card; negate that monster’s effect, and if the detached material was a “Galaxy” card, destroy that card. ● During your opponent’s turn (Quick Effect): You can take 1 “Photon” or “Galaxy” card from your Deck, and either add it to your hand or attach it to this card as material. So my final Friday card of the day pick is my favorite from the set. 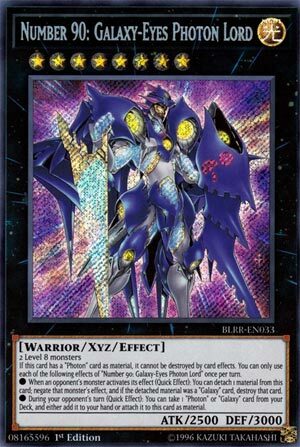 Number 90: Galaxy-Eyes Photon Lord is a Rank 8 Light Warrior-type XYZ Monster with 2500 Atk and 3000 Def. It’s stats are great. The name has everything it would need to be theme appropriate and yet splashable in Number decks as well. Light is a great attribute, but which one isn’t at this point? Maybe Fire? Anyway, It’s a generic Rank 8 requiring any 2 Level 8 monsters to bring a 2500 Beater to the field. It could have been higher Atk, but a whopping 3000 Def isn’t bad. Warrior is probably the lest useful aspect of this particular card, but is otherwise a good type. No matter how it hits the field, Photon Lord is immune to destruction by card effects if it has a Photon card as XYZ material. That’s either player’s cards, so feel free to run Torrential Tribute. Then the once per turn effects are also pretty good. At the cost of an XYZ Material, you can negate an opponent’s monster’s effect as a Quick Effect. You get to destroy the monster as well if the detached material was a Galaxy card. This effect does not target, so I like it already. Banishment would have been better, but we can’t have everything. The other effect can only be activated during the opponent’s turn, but it is still a Quick Effect. You can add any Photon or Galaxy card from your deck to your hand or use it as Material for Photon Lord. So here we have a monster with a great name, good stats, built in protection, non-targeting monster effect disruption, and the ability to thin the deck. Number 90: Galaxy-Eyes Photon Lord is a great example of balance for a theme that needed more support. Happy Friday indeed. We end this week off with my personal favorite new card from Battles of Legend as it supports one of my favorite archetypes, Number 90: Galaxy-Eyes Photon Lord. When your opponent uses a monster effect, you can detach a material to negate the monster effect then if you detached a Galaxy card, you can destroy the monster. You can take a Galaxy or Photon card from your deck and either add it to your hand or attach it to this card as material. The first effect to negate monster effects is great for any Rank 8 deck, but it benefits Galaxy/Photon decks more. Any chance to negate a monster effect is great. The second effect is another good search effect to add to the other Galaxy/Photon searchers. This card is a good Rank 8 for any deck themed around Level 8 monsters, but a great Rank 8 for the Galaxy/Photon archetype. I can’t wait til they get more support in Legendary Duelists 3 and Soul Fusion. Art: 4.5/5 One of my favorite artworks in the Galaxy/Photon archetype. Honestly, I’d have picked this card and Orgoth, for sure, had I picked this week myself, so I’m really enjoying it. (Summon Dice would have been here somewhere too). But Number 90: Galaxy-Eyes Photon Lord closes the week. Rank 8 (requiring any 2 Level 8 Monsters) Light and Warrior are awesome, 2500 attack (low but about as low as you’d want for Level/Rank 8) and 3000 defense (better). It has built in protection, which is VERY nice, especially in higher ranked XYZ Monsters. Whereas if it has a ‘Photon’ Material attached, it can’t be destroyed by card effects. It has two further effects, that can be used once each, per turn. *For a Quick effect, you can detach a Material from this card when your opponent activates a Monster effect, you negate it (and destroy it if the material was a ‘Galaxy card’). Definitely a plus, and great for a use in the theme specific Deck, as you should. Negation and destruction obviously being great things, and this is easy for you to accomplish.